The body of former United Nations Secretary-General Kofi Annan has been flown back to his native Ghana for a state funeral. President Nana Addo Dankwa Akufo-Addo received Annan’s widow, Nane Annan, and family at Accra’s Kotoka International Airport Monday. Six Ghanaian soldiers carried the casket draped with the U.N. flag off the plane. The U.N. flag was then replaced with the red, yellow and green flag of Annan’s homeland in a solemn ceremony attended by Annan’s family and senior Ghanaian and U.N. officials. 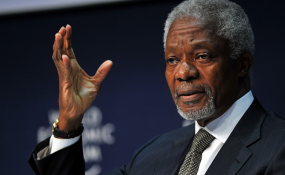 Annan’s body will lie in state at the Accra International Conference Center, where the public is invited to pay their respects before the state funeral on Thursday. The Nobel Laureate and first African to serve as U.N. secretary-general died Aug. 18 in Bern, Switzerland. He was 80.